To order a printed copy of the Museum Selection - Fine Gifts and Accessories catalogue, simply click the Request button below. Museum Selection is proud to work with various museums and galleries to offer a fine collection of home accessories, gifts and cards, with purchases of these items helping the respective organisations. Museum Selection have wholeheartedly adopted the Arts and Crafts philosophy set out by William Morris to 'have nothing in your home that you do not know to be useful, or believe to be beautiful'. Taking inspiration from country house interiors and gardens, museum collections and our great cathedrals, their aim is to bring together distinctive and unusual home accessories, jewellery, clothing and gifts celebrating over a thousand years of history, art and design. Working closely with suppliers they are passionate about their prices and quality, utilizing traditional skills and craftmanship wherever possible. Many of their products are made exclusively for Museum Selection, so you will not be able to find them elsewhere! Museum Selection - Fine Gifts and Accessories Catalogue Kenneth M. said: Great Products for presents. Museum Selection - Fine Gifts and Accessories Catalogue Vince D. said: Some fantastic gifts in this little book. Museum Selection - Fine Gifts and Accessories Catalogue John H. said: Really interesting stuff. Museum Selection - Fine Gifts and Accessories Catalogue Linda B. said: Lots of interesting and different items. Museum Selection - Fine Gifts and Accessories Catalogue Cas B. said: very exclusive taste,s brilliant if your into that kind of exclusive SUBJECT. 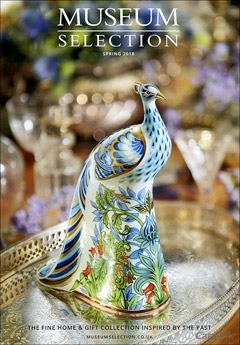 Museum Selection - Fine Gifts and Accessories Catalogue Molly L. said: Beautiful goods but quite expensive. High Quality Men’s Clothing available from Orvis. 100% Satisfaction Guaranteed. Since 1856, Orvis have been introducing their customers to a way of life that expresses a deep appreciation for the natural environment and to a lifestyle steeped in the sporting traditions and fly fishing. By pressing the Request Printed Catalogue button you give consent to Museum Selection - Fine Gifts and Accessories (and their Data Processors for the specific purpose of delivering your literature) to send you their Catalogue.